What is energy? Where do we get it? What are the consequences? One way to define energy is by observation. If you see something that doesn't happen on its own, then there must be some energy being expended. For example, cars don't go up hill on their own, so there must be some energy getting used. Coming downhill, however, we could see that happening without any energy being used. 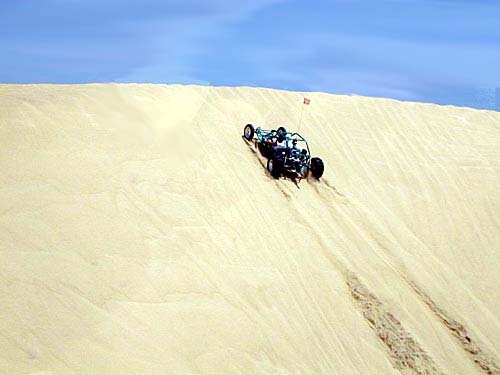 Like the car going up hill, anything that gets lifted against gravity requires some energy. Fortunately, this energy has the potential to be used again. 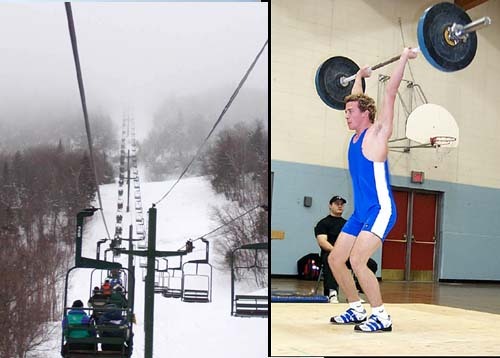 For example, the energy to raise the skiers up the mountain will be used to propel the skiers down the slopes. We can think of just two types of energy, one doing work, and the other waiting to do work. When it's doing work, we see it pushing or pulling, glowing, or changing the temperature. This train is using energy in three ways because it's pulling cars, heating up the surrounding air, and giving off light. On the left is a pile driver. A weight (the driver) is lifted up to the top of the rig. The weight now has potential energy. As it falls the potential energy becomes kinetic energy (moving energy). When it strikes the post (pile/piling) at the bottom, the energy is used to drive the post farther into the ground. It's a smart way to deliver a lot of force. Wrestlers use the pile driver maneuver by lifting the opponent and letting gravity do the work as the opponent falls to the mat head first. On the right is Hoover dam. Lake Mead is held back by the dam. Lake Mead sits higher than the ground below the dam. This means the water in the lake has a lot of potential energy. This energy is tapped when water is allowed to flow downhill (kinetic energy) and spin turbines. A set mousetrap has a spring that has been compressed (or stretched), and it's sitting there ready to convert this potential energy to kinetic energy as the wire trap flips over to the other side. A tank of compressed air also possesses potential energy. If an air tool is attached that potential energy is used to push a piston that makes the air tool mechanism spin or vibrate. The hydrogen atom consists of one proton (+) and one electron (-). The proton sits in the center (nucleus) of the atom. The proton is 2,000 times heavier than the electron. The electron is lightweight and very mobile. The diagram shows the electron as a sphere orbiting the nucleus. This is a simplistic view of an electron. Electrons are more cloud-like than ball-like. If an electron is moved farther away from the proton it takes energy because they are attracted to each other (like gravity). The farther away the electron has been moved away from the proton, the more energy it takes, and the more potential energy stored in the electron. 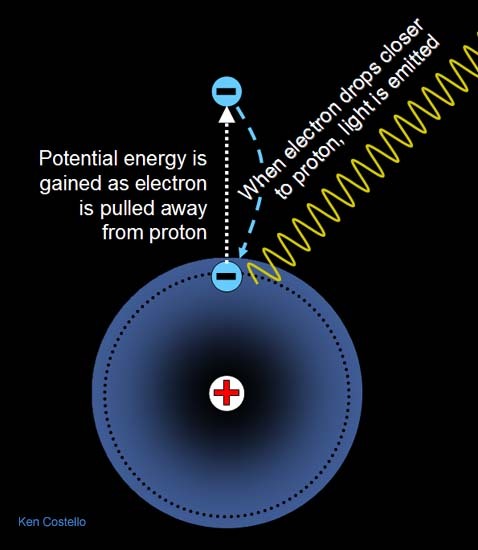 When the electron drops back closer to the proton, it will convert that potential energy to light energy. The light energy can be in the form of infrared, visible, ultraviolet, or even xray light. Chemical energy is stored in fuels like methane (natural gas) and gasoline. Let's see how methane combining with oxygen (combustion) gives up this type of potential energy. 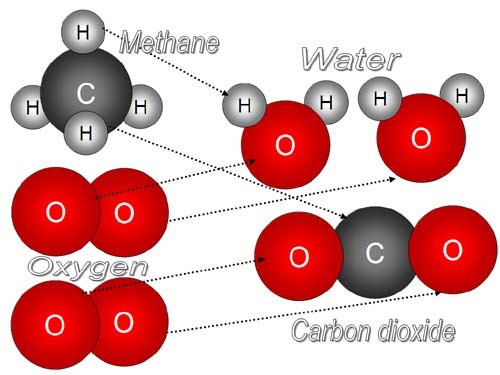 When methane collides with oxygen at high speeds (caused by flame or spark), there's a rearrangement of the atoms. Two of the oxygen atoms will combine with the four hydrogen (H) atoms to form two water molecules (H2O). 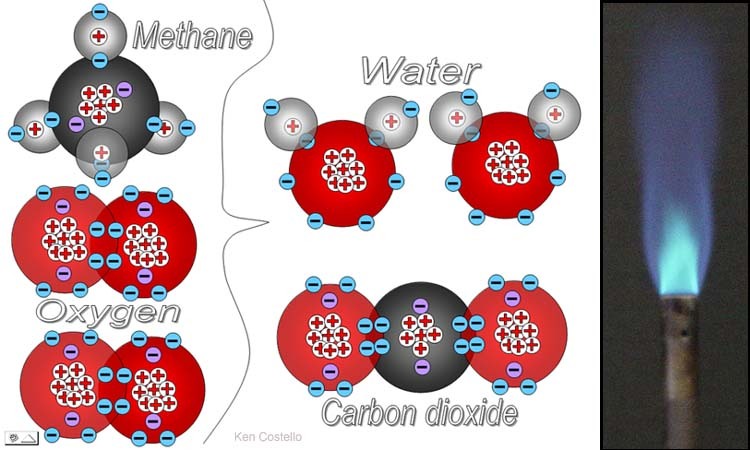 The other two oxygen atoms will combine with methane's carbon atom to form carbon dioxide. Why does this give off energy? Below is the same diagram as above, except all of the protons and electrons that hydrogen, carbon, and oxygen have are shown. Hydrogen has one proton and one electron. Carbon has six protons and six electrons. Oxygen has 8 protons and 8 electrons. Remember the electrons are all being pulled on by the protons (kind of like Earth pulling on objects on the Earth). The reason energy is released during rearrangement is that overall, the electrons are closer to the protons than they were originally. Remember when the electron on the hydrogen atom goes from farther away to closer, energy is released? Same thing is happening here except several electrons are involved. This "moving" closer to the nucleus means that some of the potential energy gets converted to light. The light is the visible light you see in the picture plus a great deal of infrared light, which is the heat you feel radiating from the flame. Where do we get energy? 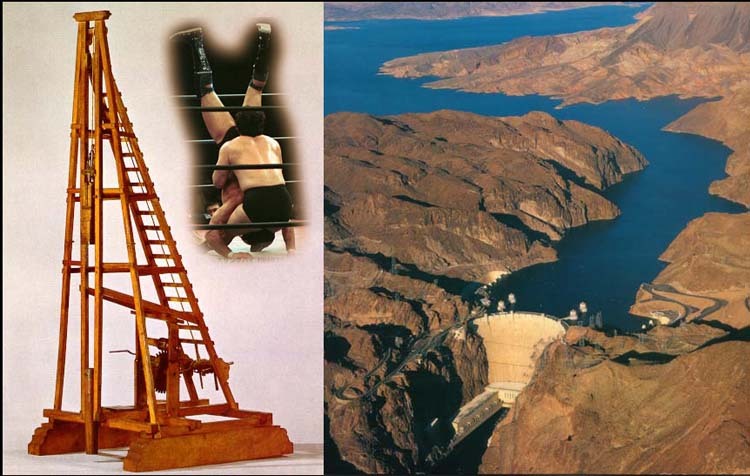 Above, you saw pictures of Lake Mead, a locomotive, and a weight lifter. But where did the energy come from that gave the water in Lake Mead the potential energy to generate electricity at the dam? 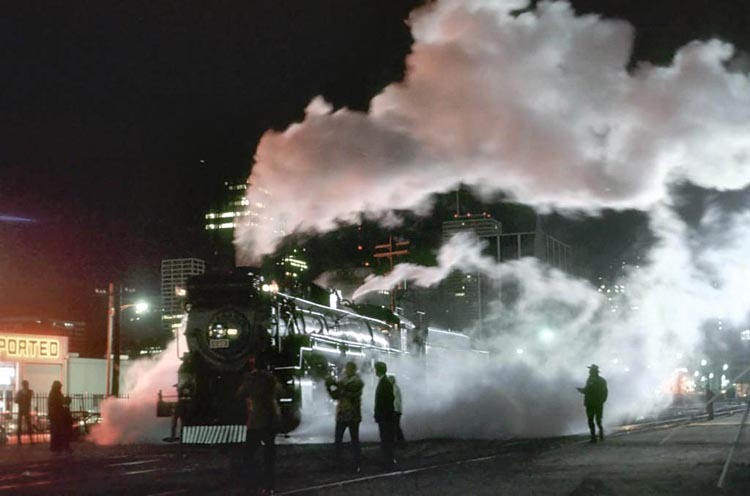 Where did the locomotive get the diesel to power its engines? Where did the weight lifter get his food and the calories to lift the barbell? Our Sun is the ultimate source of energy that we use here on Earth. The rain that filled Lake Mead came from solar energy evaporating water from the oceans. The diesel for the train came from plants that grew with the Sun's energy and eventually became petroleum. The weight lifter got his calories from meat and plants. The plants got the energy from the Sun, and the meat came from animals that ate plants that got energy from the Sun. The below picture shows the Sun and Earth and the distance between them to proper scale. If a viewer is far enough back to see the Sun and Earth together, the Sun on the left is visible, but the Earth appears as another dot against the stars in the background. 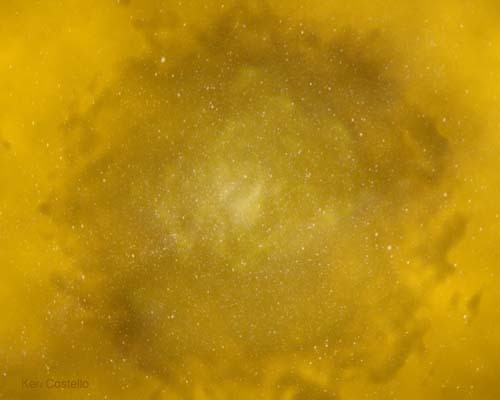 The temperature of space is colder than 400 degrees Fahrenheit below zero. Without the Sun, not only would the Earth's oceans freeze solid, the air in the atmosphere would freeze solid as well. The Sun radiates huge amounts of energy in the form of visible light, infrared light (heat light), ultraviolet, and X-rays. Earth intercepts less than one trillionth of this energy. In other words, the Sun puts out enough energy to satisfy 2,000,000,000,000 (2 trillion) Earths. 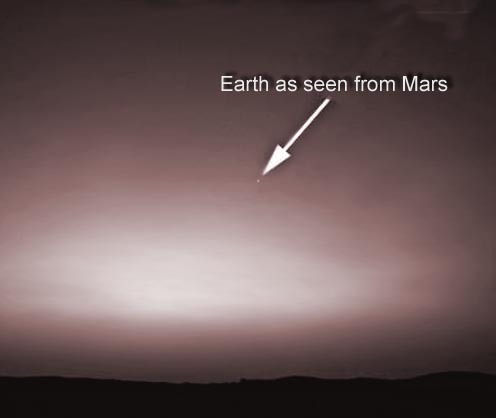 The picture on the left was taken from the surface of Mars. Earth is seen as a small dot. Mars is about 1 and a half times the distance Earth is from the Sun, which means Mars get less than half the energy from the Sun than Earth does. 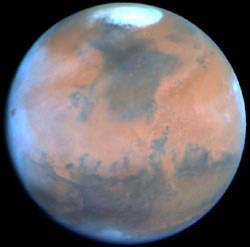 The polar ice caps of Mars is made from "dry ice" (frozen carbon dioxide) not water ice. 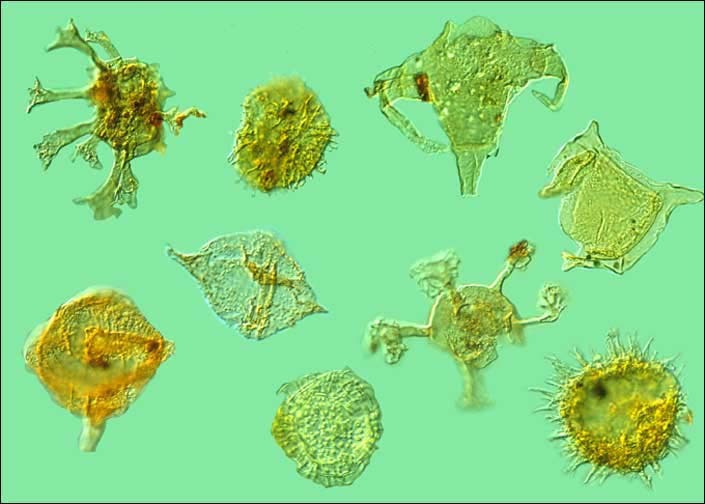 FOSSIL FUELS: Fossil fuels get their name because they formed from microscopic plants millions of years ago (see pic below). Fossil fuels include natural gas, coal, and the fractions of petroleum such as gasoline, oil, diesel fuel, propane, butane, and tar. Nature has taken 60 to 300 million years to make these fuels, but we might use them up in 17 to 70 years from now, depending on future consumption. Wind power is a growing source of renewable energy. Fossil fuels are not renewable (unless we can wait 100 million years). But wind power renews itself every day as the Sun energy creates uneven heating and wind is produced. California has been using wind power for quite awhile. 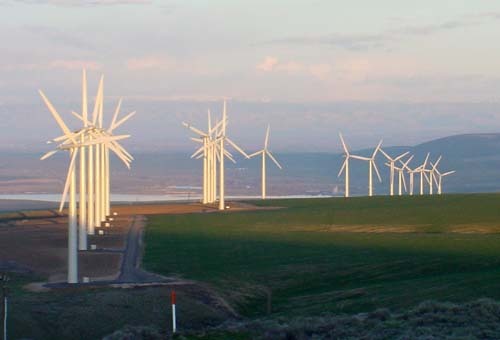 Arizona will start its first wind farm this year near the northeastern town of St. Johns. I have a trailer near there, and will vouch for the high winds that come through there. Many of my neighbors use wind generators. 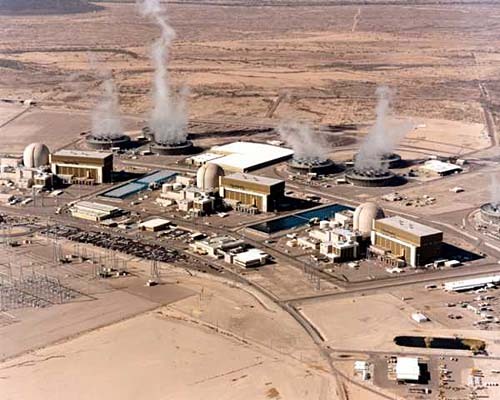 NUCLEAR POWER makes up a small fraction of the power in the US; however, the Palo Verde nuclear plant near Phoenix, is responsible for a large percent of Phoenix's electrical power. 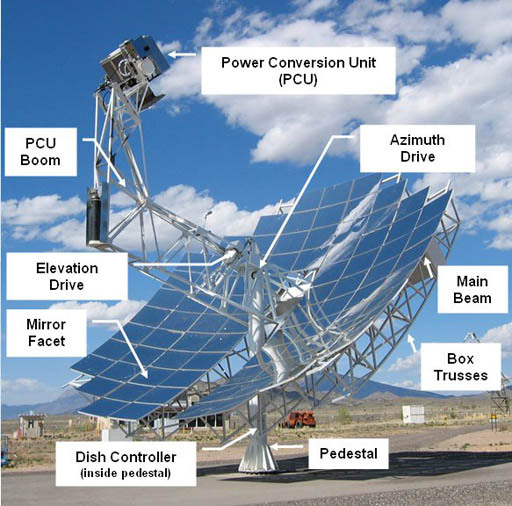 SOLAR ENERGY captured with photovoltaic cells (solar cells). Photovoltaic gets its name because the energy of light (photo) is used to create voltage (voltaic). Photovoltaic cells offer a simple way to get electricity, at least DC (direct current) electricity used in charging batteries. The problem with photovoltaic cells is that they are expensive because the making of a solar cell is similar to making a computer chip. There are some new designs that make flexible thin films of solar material in the same way newspapers are printed. Those promise to bring the costs down even though that hasn't happened yet. 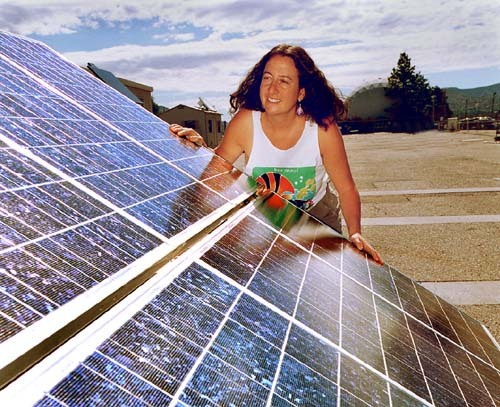 Photovoltaic cells convert about 15% to 20% of the sunlight into electricity. 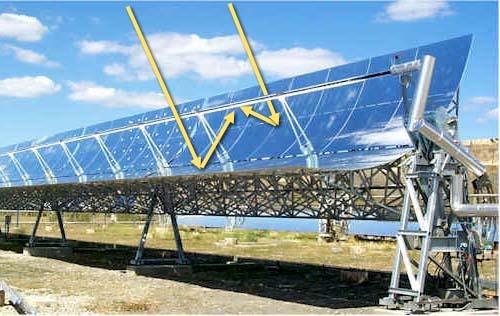 Another approach of using the Sun's energy is to focus the heat from the Sun (infrared light) onto a tube filled with oil. 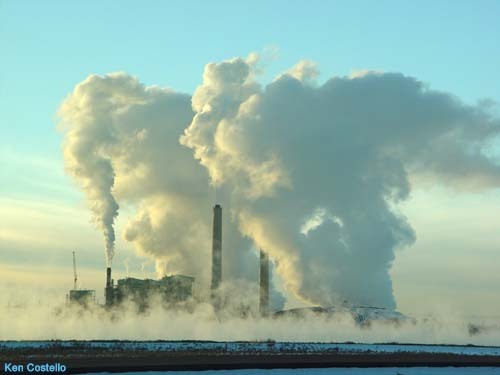 The heated oil is then pumped to an adjacent generating plant that uses the heat to make steam, which then pushes on turbines hooked to electric generators. The polished metal reflectors are cheaper than photovoltaic cells. Even though these panels are fairly simple, you must have steam-powered turbines and electrical generators attached to these collectors. When done on a large scale, thousands or millions of watts of electricity can be generated from the free energy of the Sun. Even though the energy is free from the Sun, it takes about 20 to 30 years to recover the cost of setting up a solar power station. But one good thing about solar is that in hot climates it produces the most energy at the time it is needed the most, like for air conditioning. Solar Powered Stirling Engine:. A Stirling Engine is a piston driven engine where the gas is heated from the outside of the piston's cylinder rather than from gasoline burning inside of the cylinder. 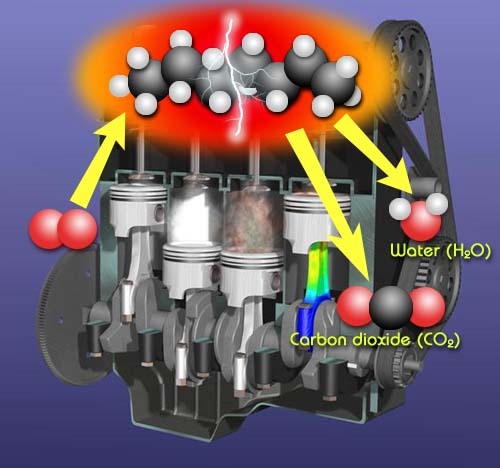 The Power Conversion Unit shown is like a 4 cylinder car engine except instead of combustion of gasoline causing pressure in the cylinders, heat from the sun heating helium gas provides pressure in the cylinders that push on the pistons. The pistons turn a crankshaft hooked to an electric generator. 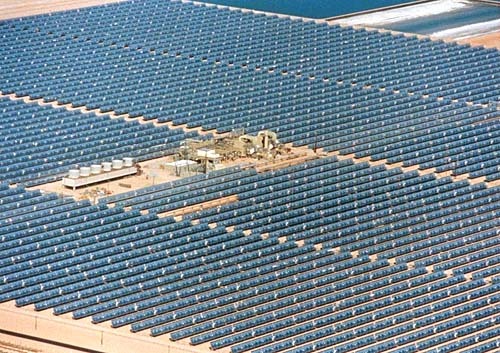 This type of solar energy conversion to electricity sets the record for efficiency. About 31% of the sun's energy gets converted to electricity. 60 of these dishes are at a power station in Peoria, Arizona. At 25,000 watts each, that totals 1.5 million watts. Passive Solar Heating. 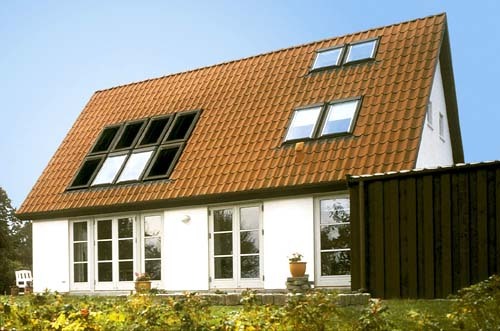 We should also include passive solar heating. They are extremely efficient. The panels are not photovoltaic cells; they are just black metal behind panes of glass. Air, water, or an antifreeze solution passes next to the dark metal that gets hot from the Sun. The hot air, hot water, or hot antifreeze brought into the home to heat the home or to assist the hot water heater. They are much cheaper than photovoltaic panels. So this is a much better way to create heat in the home versus generating electricity and using it to run a space heater or electric water heater. What are the consequences of using energy? The positive consequence is that we have the energy to make the products we want, travel to where we want, keep ourselves warm or cool, and to power all of the appliances and devices we like in our lives. The negative consequences can be categorized as inescapable consequences and unfortunate consequences. INESCAPABLE CONSEQUENCES: The laws of physics cannot be broken. One such law states the impossibility of ever making a perpetual motion machine, which is a machine that does work without any extra energy going into it. 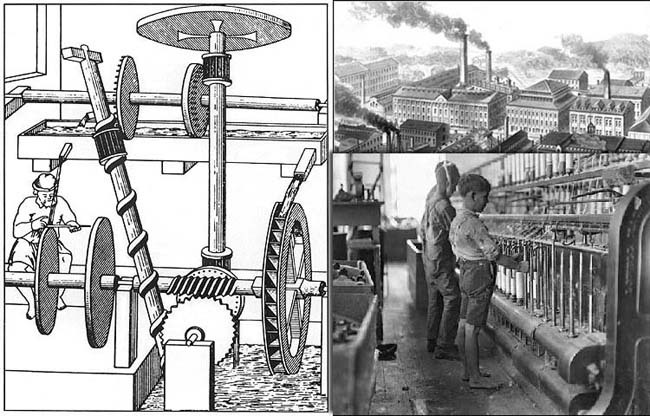 In the beginning of the industrial revolution, attentioned focused on the efficiency of machines. Factory owners wanted machines that could either provide work without added energy or at least do work with 100% efficiency. The result of the research was that neither was possible. 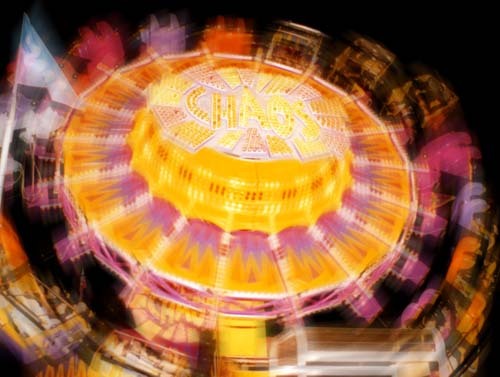 INESCAPABLE CONSEQUENCES: The picture on the left is a perpetual motion design. The water in the upper trough pours out on the water wheel on the right. The water wheel turns and the craftsman uses the left wheel for grinding. The tilted corkscrew apparatus is called the Archimedes screw which has the ability to raise water if the screw turns. The water wheel is suppose to provide power for the grinding wheel and the Archimedes screw that will replenish the water to the upper trough. Like all Perpetual Motion Designs, the flaw is that energy gets wasted as heat and there's never enough energy to keep the machine moving. In this example, the falling water will not have enough energy to turn wheels and gears and also pump the same amount of water back into the trough. The friction of the gears, water stirring, and water flowing will turn the potential energy of the raise water into heat. INESCAPABLE CONSEQUENCES: Energy lost to heat is the final outcome of most anything we do with energy. Let's examine the above collage. The locomotive's purpose is to pull railroad cars from one place to another. However, nearly all of the energy it consumes goes to creating heat rather than moving the cargo. The steam engine or gas engine gets its power by heating a gas which expands and pushes on pistons which turns the wheels. The hot gas is then released (exhausted) so the pistons can return to their original position. The heat energy in the gas is now lost to the environment and no longer available to produce motion. The weight lifter gets calories from food for energy to lift weight and maintain the body's metabolisum. Only about 20% of the calories gets used by the body, the rest is lost to heat that escapes to the surrounding air. Even the energy in the raised weight will get lost when it hits the floor and warms the spot on the floor where it hits. Electricity turns a piston in the air compressor to compress the air. The air gets quite hot as it has its molecules pushed closer. This heat energy could provide additional potential energy and pressure. However, the heat quickly dissipates through the metal walls of the compressor and is lost. The wind generators get energy from the wind. However as the propellors turn, some energy is lost by friction of the bearings. As it generates electricity the friction of electrons travelling through the wires produces heat, which reduces the efficiency of the generator. In other words, whenever we use energy, most, if not all, will be lost as heat that will no longer be available for doing useful work. If your life seems more chaotic as time goes by, don't feel alone. All of the universe is experiencing the same problem. When energy is used, more disorder (chaos) is created. In physics this is called "entropy," a measure of disorder often resulting from heat. For example, the atoms of carbon and hydrogen in gasoline are lined up neatly in chains. After energy is released, the atoms are scattered and randomized. In other words, car exhaust has much higher entropy (disorder) than does gasoline and oxygen. In part because exhaust is a gas, which is bouncing in all directions. The extra heat causes even more random movements. A warm homogenous soup. Because of this law which states all natural events lead to ever increasing disorder and wasted heat, a prediction of how the universe will end has been made. When the universe reaches uniform temperature and maximum randomness, we can no longer extract energy to do work or to survive. Don't worry. If true, it's still billions of years from now. 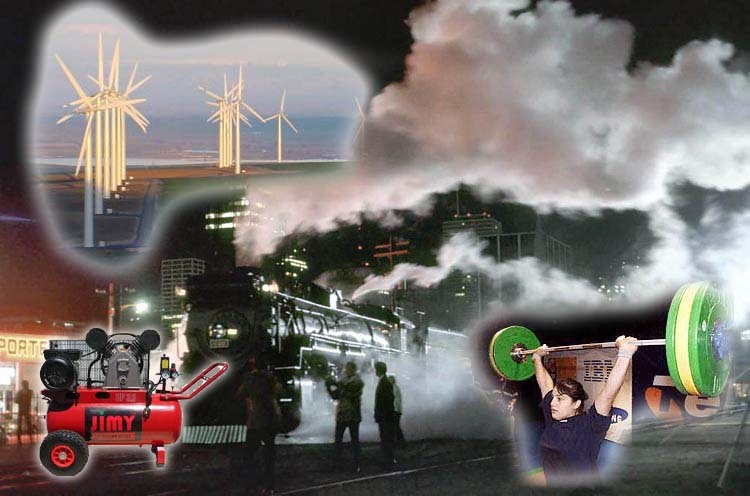 Greenhouse Gases and Pollution: Most of our energy comes from fossil fuels. The unfortunate consequences of this as you learned is that at a minimum it produces the two global warming (greenhouse) gases of water vapor and carbon dioxide. Since burning of fuels is done with air instead of just oxygen, we get nitrogen oxides forming. These are toxic and contribute to pollution. If the fossil fuels have impurities, such as sulfur, these impurities will end up in the air we breathe. The energy in lightning splits oxygen molecules. These atoms of oxygen are very reactive and will immediately combine with other gases they encounter. 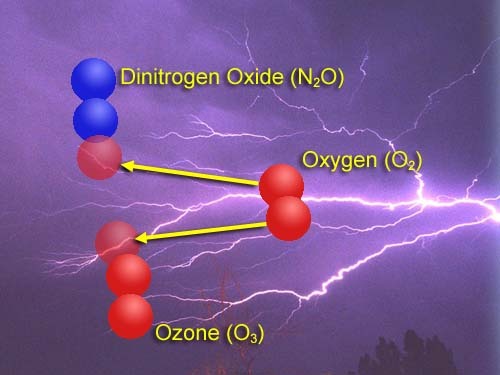 If one bumps into nitrogen, it will form dinitrogen oxide. If it hits an oxygen molecule, it forms ozone. Both are toxic. Additionally, any sources of high voltage or electric sparks can do the same thing. Copy machines, laser printers, electric drills, spark plugs, bug zappers, vacuum cleaners, TV sets, and other similar devices can produce these toxic products. High energy can produce molecules of high energy, which are often dangerous.